1. Write down your “why,” the reason that you coach. Not just a phrase, but in actual paragraph form, written by hand. “I coach because…” Keep it somewhere where you can go back and look at it every once in a while. 2. Have an email folder or a place where you can store what I call “rainy day reads.” Put positive e-mails, notes of thanks and other feel-good words of encouragement in there. When you are having a day where you are feeling less than motivated, open this folder and read its contents. 3. Exercise. Stay fit. It can be tough to keep an exercise habit through long weekend meets, crappy hospitality food, and hours upon hours of standing on deck. I am willing to bet your hotel has a treadmill and I can tell you from experience that it is not being used at 10pm. Read this article. 4. Seek out other ideas. Reading our blog, ProSwimWorkouts, or these resources helps keep your practices interesting for you AND your swimmers. 5. Have a plan. Not having to go through the “what are we doing today” process makes it easier to stay the course over the length of the season. 6. If you had your swimmers fill out goal sheets at the beginning of the season, go back and read through them again. Seeing the dreams and goals of the swimmers in your care will help re-charge your batteries. 7. Thank your mentor. All of us have someone who helped us get started in the sport. Visit them or call them up and express your thanks. Gratitude is the best attitude. Stay Motivated, Stay Positive, Stay Successful. Editor’s Note: The Swimming Wizard’s goal is to publish at least one set, practice, or idea EVERY DAY! To keep it interesting, we need your help! Click here to help us achieve that goal by submitting one of your sets! This motivational idea comes from the Panama City Swim Team and Coach Jonathan Kaplan. Check it out on the PCST website. 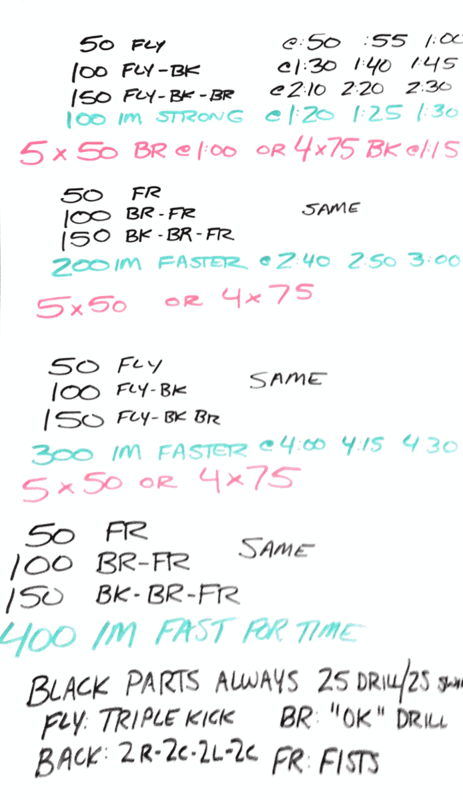 The premise: Simply count daily yards for all of the swimmers on your team. Use an excel spreadsheet to make it simple to count up the running total. Recognize those swimmers who achieve milestones – 1 million, 2 million, 3 million, 4 million (!?!) yards. Post a weekly running total in a visible place at your facility. This exercise encourages attendance and becomes a good measuring stick for who “has been putting in the work.” Jonathan’s swimmers at PCST were able to achieve a million yards on mostly single practices, with doubles only in the summer months. You can download a simple excel spreadsheet to begin keeping track of your athletes’ daily yardage here.